Let’s be honest, even though everybody rates their own version of scrambled eggs as the best, and despite cooking them alongside many a notable chef, there’s no question that the following version along with it’s accompaniments outshines all other pretenders to the Crown. Predictable preamble? Well, I cooked this for Frank Williams, man of action and long-time Greg Norman manager. He went home and divorced Melissa, claiming her scrambled eggs amounted to fraud. They’re seeing a counsellor and may pull through this, but such is the impact of the recipe to follow. Please, be warned… They’re a game changer. Run the knife tip lengthways along the sausage two to three times, barely penetrating the skin to prevent curling in the pan. Then, slice into thin rounds. Salt, White Pepper, Fresh Chives and Sweet Chilli Sauce to serve. If I hear another two bit, baby faced, pseudo food authority tell me, or anyone else, to use nothing but the best ingredients, God knows, I’ll explode. However, for this recipe, please, use nothing but the best ingredients… No really, it’s an outstanding dish only with the right ingredients and proper technique. 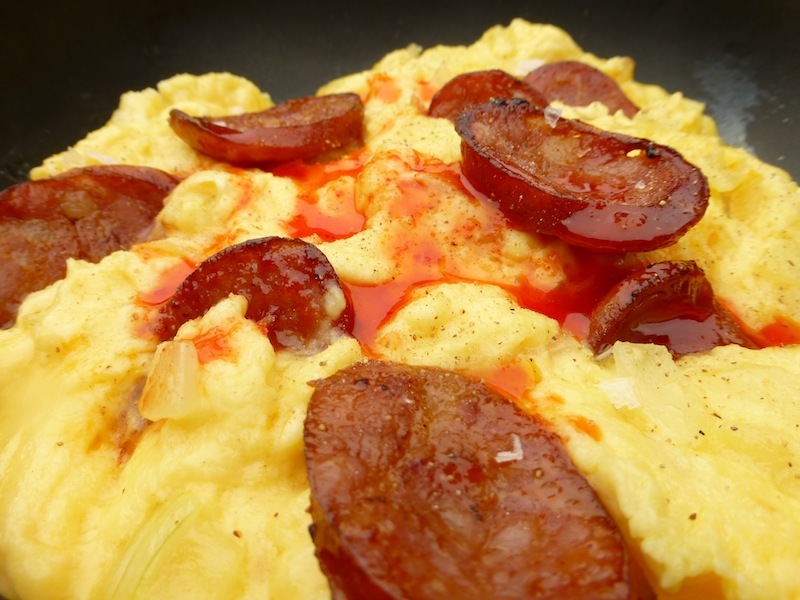 In a non-stick frypan very gently fry the slices of chorizo in a touch of olive oil until just brown on both sides. Remove and set aside until serving. Take the onions, the first lot of butter along with a generous pinch of salt and about 3-4 tablespoons of water and place into a small non-stick pot on medium heat. Cook until the onions are completely translucent and water evaporated. You may need to add a tablespoon or two extra of water, keep an eye on things. This is the standard method I use for softening onions in butter; it guarantees the onions don’t brown (nothing wrong with brown, I’m brown) but it’s not the soft, rounded, perfumed, magical butter flavour we need. While the onions are transforming, whisk the eggs first, to beat out the white and yellow streaks then whisk the milk in and add the second lot of butter. Keep aside. When the onions are translucent, tip in the egg mix and turn up the heat, immediately and without stopping, scour the bottom and sides of the pot with the flexible silicone spatula (harder to do with a wooden spoon). Keep scouring and folding gently, as though you’re folding beaten egg whites into a cake mix. The extra butter will gradually melt and be incorporated into the mix and beautiful folds of eggie curds will develop. Try to make these as large and unbroken as possible; you’re doing the dance of the scrambled egg. 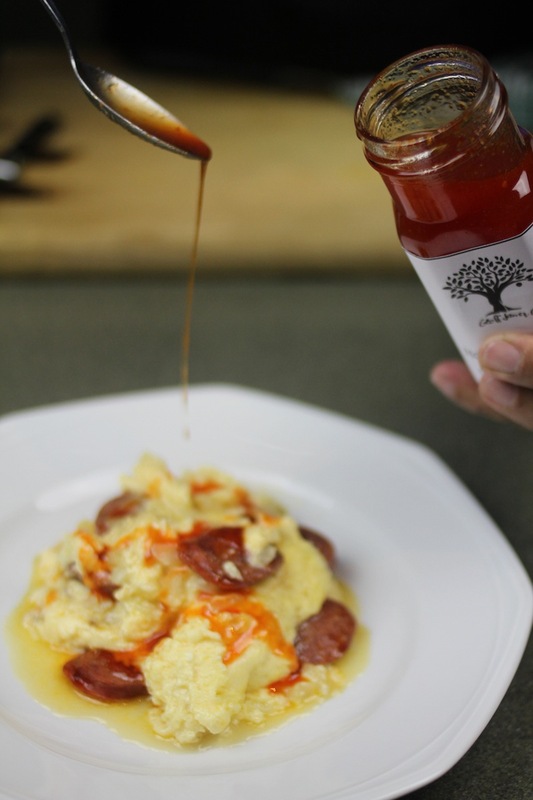 Just before the eggs have set to your liking (and we’re all different here), gently and completely fold through the cooked chorizo slices, keeping the curds as whole as possible. Immediately serve the eggs sprinkled first with flaky sea salt and ground white pepper, then drizzle Hot and Sweet Chilli Sauce and finally scatter chives. Serve with proper white toast and real butter. You are now the proud owner of the person for whom you cooked this.